Educators should explain to students how the matching of tree rings between trees of different ages is done (by searching for patterns to extend the record past the life of just one tree). Great opportunity to touch on radiometric dating techniques that allow scientists to absolutely date trees that are found in bogs and other environments. Trees don't die from coring - students will probably ask. Educators should explain to students the elliptic growth of trees. Educators should indicate that dendrochronology is a complex science and large uncertainties can exist. Educators might want to provide alternatives to a simple cross section of tree rings and provide a better explanation of tree coring. Educators may want to project images instead of using overhead transparencies. Additional Resources links on page 4 don't work. Two of them are incorrect and one of the NASA websites is not available anymore. 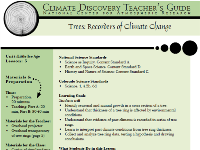 For a good alternative activity on dendrochronology see [link http://cleanet.org/resources/41807.html 'Signs of Change: Studying Tree Rings'] activity. Additional resources and science articles about dendrochronology at the Arizona Tree Ring site http://www.ltrr.arizona.edu. The links between tree ring thickness to past climate and other influences on tree ring thickness are not well described and should be provided through supplemented materials by educator. Lots of background materials for students to understand the scientific process. Comment from scientist: Sometimes wood from ancient structures, when aligned with chronologies from living trees, extends a chronology even further back than indicated in activity. The date of the structure provides an approximate date of when the trees were felled. One chronology for river oaks from southern Germany extends more than 10,000 years, and another for bristlecone pine in the White Mountains, California extends more than 8,500 years. More background information: Esper, J., Cook, E.R., and Schweingruber, F.H. (2002). Low-frequency signals in long tree-ring chronologies for reconstructing past temperature variability. Science, 295, 2250-2253. Good example of how to use analysis of data and graphs to infuse content knowledge. Plotting graphs and analyzing data addresses needs of visual learners. Activity does excellent job of supplying good questions for educators to ask students at the beginning of lesson and to scaffold learning. All materials are available in printable form.